From cockfights, bullock races, playing cards to flying kites, the three-day festival brings together people who indulge in festive sports. Hundreds of crores of rupees and assets are bet over cockfights (despite a ban by the High Court) during Sankranti. It’s time to bid adieu to the cold winter days and welcome the warmer days that are around the corner, that’s heralded by Sankranti. But what is Sankranti without its traditional sports? From cockfights to bullock cart races to playing cards and dice to flying kites, these games are associated with the three-day festival bringing cheer and entertaining rural revellers. Hundreds of crores of rupees and assets are bet over cockfights (despite a ban by the High Court) that enjoy political patronage in the Telugu states. According to him, “People from several other states come here only to witness cockfights. 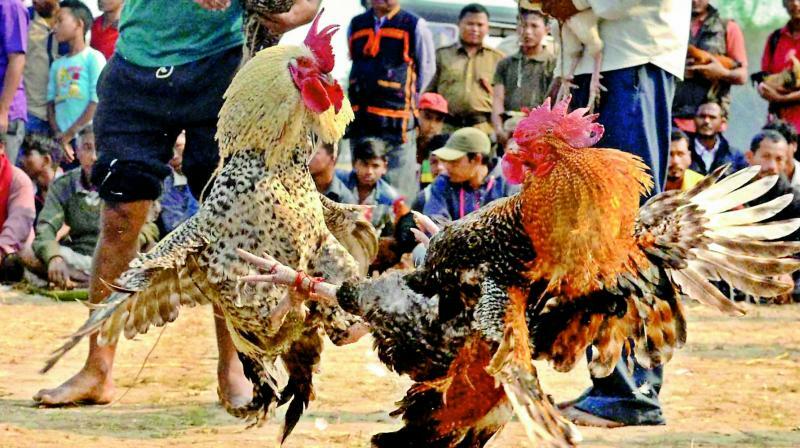 Without a cockfight, there’s no Sankranti. Since it is played only once every year, I don’t see it as gambling. If you look at the massive crowd, the grandeur and the arrangements for this event, we just cannot ask for a better Sankranti,” says Kasi. Similarly, bullock races also are identified with the festival of harvest. Bullocks in hundreds of pairs drawn from Nellore, Kadapa, Prakasam and other districts take part in the races in Rayalaseema region. “This activity draws a huge crowd from fun lovers from all over the state. This time, my bullock is also participating and we have prepared well. Hopefully, we will race to the finishing line,” says Veerayya, one of the participants who hails from Chittoor district. Another big attraction is playing cards, and the game can be played in different ways. Kites and dice continue to be one of the favourite pastimes and traditional sports of Sankranti. Colourful kites of different sizes flutter in the sky above with quite an audience looking upwards. And the best ones are rewarded. While cockfights and bullock races tend to be a macho sport, women have their own fun as they decorate their houses with colourful rangoli and even play hopscotch competitively.